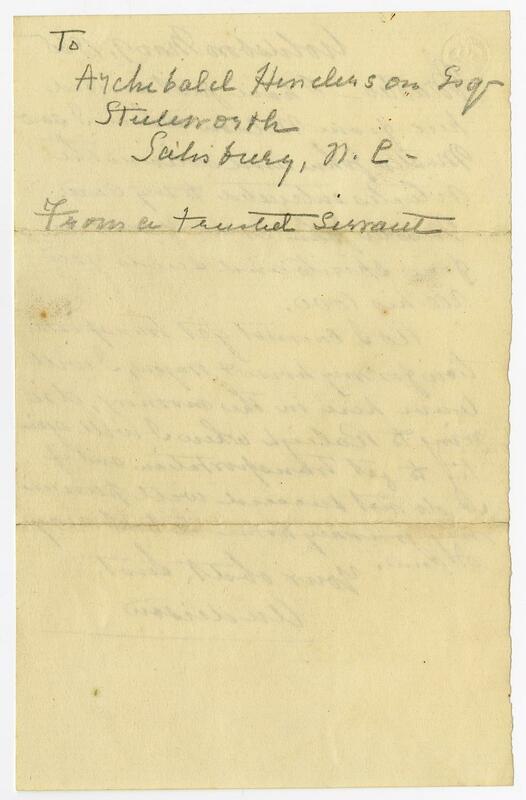 Item Description: Letter dated 9 March 1865 to Archibald Henderson from his servant (or slave) Henderson. It seems that Anderson was a slave belonging to Archibald Henderson who was hired out to a Mr. Wilkins in Wilmington. Item Citation: Folder 37, John S. Henderson Papers, #00327, Southern Historical Collection, Wilson Library, University of North Carolina at Chapel Hill. Master__ I have just arrived here from Weldon where I saw Master John and delivered the articles entrusted to my care. Master John is well and in fine spirits and sends you all his love. As I cannot get transportation for my horse + wagon, I will leave here in the morning, driving to Raleigh where I will again try to get transportation and if I do not succeed will pursue my journey home the best way I can. 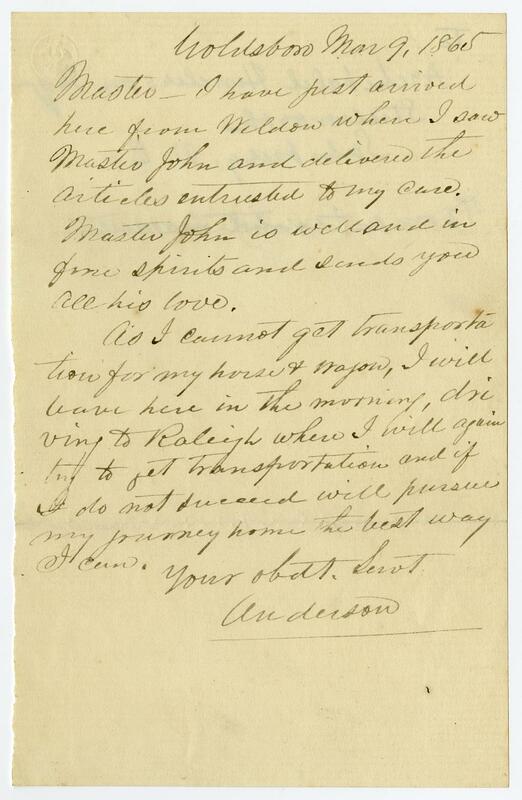 This entry was posted in Southern Historical Collection and tagged Anderson Henderson, Archibald Henderson, hiring out of slaves, John S. Henderson Papers, Raleigh N.C., travel, Weldon (N.C.). Bookmark the permalink. I think I am too trapped in the 21st century to understand this. He is looking for transportation for his horse and wagon. I thought those were transportation. Does he want to move them by rail? Is the horse or wagon or both not travel ready?